Monarch butterflies and many other pollinators have experienced population declines due to urbanization and land-use change. In response, concerned individuals and groups in many urban environments have built green spaces such as gardens and parks, which attract pollinators. Studies have shown that urbanization can affect host density, altering patterns of infection in wildlife, however, most research has focused on the associations between urbanization and vertebrate animals who carry zoonotic pathogens. Understanding the impacts of urbanization on pathogen transmission in insect pollinators is important, as pollinators play a crucial role in agricultural production. Isolated urban greenspaces cause pollinators to coexist within closer proximity, and researchers predict the resulting increased contact rates could increase pathogen transmission and/or alter susceptibility or tolerance to infection. A team including CEID members Ania Majewska and Sonia Altizer sought to determine if urbanization, at two different spatial scales, predicts infection by Ophyrocystis elektroscirrha (OE), a protozoan associated with decreased monarch lifespan, reproductive success, size, flight, performance, and migratory success. Researchers, along with citizen scientists from the ongoing Project Monarch Health, tested butterflies for OE infection at 85 sampling sites in the southern coastal U.S., northeastern U.S., and Hawaii. 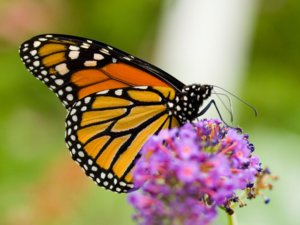 Both southern coastal U.S. and Hawaii have non-migratory monarchs, where the northeastern U.S. has migratory monarchs. Examining over 3,500 samples, they determined which monarchs were infected (sample contained more than 100 OE spores), and which were not-infected (sample contained less than 100 OE spores). They then used land cover and impervious surface data to calculate urbanization. They found that monarchs sampled in the northeastern U.S. had the lowest levels of infection and monarchs sampled in the southern coastal U.S. had the highest levels of infection. They also found associations between infection status and urbanization metrics, though this differed among the sample regions. The results of their study suggest that urbanization increases the risk of OE in non-migratory monarchs in the southern coastal U.S. Researchers predict that the prevalence of OE infections will increase in regions altered by expanding human development. As monarch populations continue to decline, there is a need for additional research into the consequences of parasitism for monarch populations, and strategies for lowering risk of infection, especially in areas of expanding urbanization.